Happiness is Pearl's job. Using the revolutionary Apricity machine, every day she provides customers with personalized recommendations for their emotional wellbeing; from eating more tangerines to cutting off a finger, from getting a dog to getting a divorce. She's good at her job, her office manager tells her. But Pearl is starting to wonder whether it's even possible to measure an emotion. Pearl's teenage son, Rhett, is a sensitive boy who has forged an unconventional path through adolescence. He seems somehow to find greater contentment in being unhappy. If only Pearl could persuade him to take the Apricity test... but what if she doesn't like what she finds? 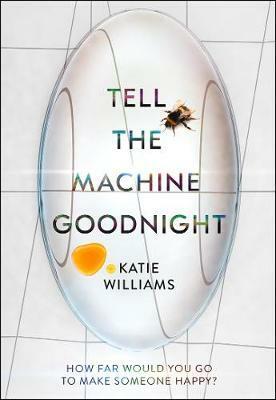 TELL THE MACHINE GOODNIGHT is a wry, prescient and hilarious debut. For fans of Jennifer Egan and Ruth Ozeki, it is both a cautionary tale about the advance of technology and a scalpel-sharp depiction of the darkest depths of the human psyche.